Begin exploring Animal Consciousness? through BodyTalk. Printed from http://www.bodytalksystem.com//learn/news/article.cfm?id=875 on Apr 22, 2019. 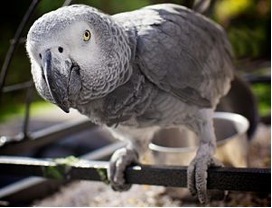 "Near human-like levels of consciousness" have been observed in the African gray parrot. Loesje: I would like to invite all of you who have completed BodyTalk Fundamentals and Principles of Consciousness to join me in an exploration of the consciousness of the animal kingdom through BodyTalk for Animals seminars and sessions. I, for most of my life (this time around), as well as people all over the globe, have been attempting to answer the amazing amount of philosophical, biological, psychological and neurological questions concerning consciousness that has occupied intellectuals for centuries, yet few conclusive verdicts have been reached. Wikipedia: The topic of animal consciousness or animal awareness is beset with a number of difficulties. It poses the problem of other minds in an especially severe form, because animals, lacking the ability to express human language, cannot tell us about their experiences. Also, it is difficult to reason objectively about the question, because a denial that an animal is conscious is often taken to imply that it does not feel, its life has no value, and that harming it is not morally wrong. Loesje: I continuously wonder ... When I get an animals 'story' via Active Memory on the BodyTalk protocol chart, combined with the concept of animal communication and/or by utilizing the orientation and definition boxes on the BodyTalk procedure chart, is the animal communicating in a non-verbal intercellular, consciously conscious way, or am I 'just' reading the animal's hologram? ?The Cambridge Declaration on Consciousness in Non-Human Animals, written by Philip Low and edited by Jaak Panksepp, Diana Reiss, David Edelman, Bruno Van Swinderen, Philip Low, and Christof Koch: "Non-human animals have the neuroanatomical, neurochemical, and neurophysiological substrates of conscious states along with the capacity to exhibit intentional behaviors. The absence of a neocortex does not appear to preclude an organism from experiencing affective states", they write. "Consequently, the weight of evidence indicates that humans are not unique in possessing the neurological substrates that generate consciousness. Non-human animals, including all mammals and birds, and many other creatures, including octopuses, also possess these neurological substrates". It goes further to conclude that "numerous documented animal behaviors must be considered consistent with experienced feeling states". Loesje: Hmm ... I remember answering a phone call from my friend Georgia. We were deciding on taking a trip to Calgary, Alberta, Canada for a Principles of Consciousness class taught by Sylvia Muizinieks. During the phone call one of my horses named Frenchy, non-verbally (telepathically) communicated to me that he had something to tell Georgia. I ignored the inner voice, as "I must be crazy"! Frenchy then proceeded to lay down and stare at me as I continued my phone conversation. Well... I'd better pay attention to 'that' behavior, an apparently consciously driven sign from 'just' a horse! So I played along ... I walked over to Frenchy in the arena and to my surprise he didn't get up (not exactly usual horse behavior, as most horses would jump up as a person approaches (gotta keep safe ya know, ready to run to a more comfortable spot and all). Once again, I played along as I sat down beside Frenchy. By now Georgia had decided not to come to Calgary. Yet, I thought I kept hearing Frenchy say "I gotta talk to Georgia "! So I put the phone up to Frenchy's ear and mouth (I know, I know ... anthropomorphizing) the message I thought I heard was, "Georgia, you have to go to Calgary because your daughter will be there". I passed the message on. Georgia thought I really WAS crazy. Why on earth would her daughter be there, she lived hours away from Calgary. I thanked Frenchy, and Georgia hung up the phone. As you may have guessed, she immediately called her daughter. Ten minutes later my phone rang. It was Georgia. Wow, she said, "I can't believe it", my daughter will be in Calgary for the five-month ultra sound of her in-utero twin girls! What a great excuse to come to Sylvia's class, can I still drive with you? Details – Yes – More Specific - Yes: I had been doing BodyTalk sessions for the in-utero twins, because one of them had markers for downs syndrome, and the doctors had given the parents the option, if at five months after checking via an ultra sound the markers were still there, they could decide to abort that particular twin. Well, that was not ever an option in the hearts and minds of both parents! Yes, Georgia met her daughter for the ultrasound, and yes, Frenchy "knew"! The ultra sound showed all markers for downs had disappeared!!! Hmmm ... Once again, another one of 'those' questions of mine. Did Frenchy really know all of that and did he want to make sure we were aware of the importance of Georgia being there with her daughter? Or, was he a projection of my deeper level of awareness, and he is me, and "I AM" through the horse, bringing awareness and attention to myself? In Michel de Montaigne's excellent passage on animal minds in the "Apology for Raymond Sebond", in which he writes about playing with his cat and wonders who is playing with whom, there is a funny and deceptively profound final sentence: "We divert each other with monkey tricks," he writes. Meaning he and the cat. Both human being and cat are compared with a third animal. They are monkeys to each other, strange animals to each other. (The man is all but literally a monkey to the cat.) All three creatures involved in Montaigne's metaphor are revealed as points on a continuum, and none of them understands the others very well. This is what the study of animal consciousness can teach us, finally--that We possess an Animal Consciousness. Loesje: Does that mean that I AM an ANIMAL? Marc Berkoff: So, why do animals matter? Even if we're not sure about whether some animals are conscious, intelligent, and emotional beings, they also matter because they exist, not because of their service value to us. By paying attention to what we know about their fascinating lives and who (not what) they are, we can, and must all work together in harmony, to make their lives better. Loesje: I have to agree with Marc Berkoff's comment below, as well as mirror it: "As I travel all over the world I see that we are making much progress, because so many people really do care about the well-being of other animals". 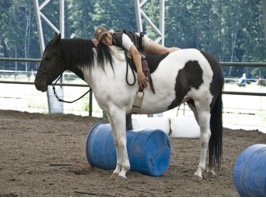 Loesje: While I was grooming and training dogs, cats, and horses for 25 years before BodyTalk found me, I was experiencing what at the time I thought were inexplicable happenings. I would touch an animal and "know" something about their well-being or that of someone in their family or community. Thirty years ago I didn't dare to tell anyone what I was experiencing. The experiences did not quit. They continued to get more frequent. They grew more profound and more synchronistic. Then, they even happened when I wasn't touching the animal. I began to explore what this might mean, and as I opened myself up to receiving more of their information it was as if they knew that I was now truly listening. New messages began; "If you help us heal and change, someone in the family can heal and change. If you help us we will help you. Please find a way to help us help the humans". Wow! Now what? I finally said to the animals, and myself, "I am willing to explore that possibility". Like a needle in a haystack, in a rural town in Armstrong, BC Canada, BodyTalk found me in 2001. Since then, my journey with the animals and exploring the concepts of "What is consciousness. Who and/or what is a consciously conscious being" seems to only get increasingly profound. Yes, the rabbits are far down the rabbit hole in this one! In 2001 there was no BodyTalk for Animals. Because of my passion to learn from the animal kingdom, I did literally hundreds of sessions with the BodyTalk Modules 1,2 concepts (that's what we called BodyTalk Fundamentals back in the day) with great results. Fortunately for me the animals taught me throughout. In 2004 I began to utilize BodyTalk for Animals, at that time, the pre-requisites were Modules 1 and 2, (now known as Fundamentals and was taught by Sandy Davis) the techniques were done, by touching the animals for each technique. Wow, I had some interesting results. But, doing sessions hands on with the animals was a bit too risky from a personal safety aspect, as well as legally. In 2006, because of those concerns for the personal safety of the practitioner, as well as the potential legal ramifications, we started to work with BodyTalk for Animals in a whole new way: Principles of Consciousness was now a pre-requisite, NO TOUCHING, a firm requirement. For those of us who had worked for years, hands on with the animals, utilizing a surrogate was an extremely challenging concept! Once accustomed to these exciting new additions, I realized I had just begun to experience the powerful potential of BodyTalk for Animals. In the past eight years, I have had the great fortune to travel extensively, meet and work with pioneers from all walks of life who are also exploring new possibilities in the world of animal – human interconnectedness, BodyTalk for Animals and intercellular communication! Recently I am also seeing a remarkable increase in the number of veterinarians, veterinary clinic staff, zoos, rescue societies, dog trainers, groomers, horse enthusiasts, horse trainers, bird sanctuaries, and other animal professionals from around the globe embracing this modality. Professionals such as Dr. Birute' Mary Galdikas, her staff and over 330 orangutans of the Orangutan Care and Quarantine Centre, Way Kambas National Park vets, staff and 66 elephants in Sumatra, the staff and the chimpanzees at the Jane Goodall Sanctuary for Chimpanzees, at Chimp Eden in South Africa, among others, have all personally joined in this exploration with me, and I with them. To those of us that share our lives with animals in our homes, wild and domestic animals on our properties, and BodyTalk enthusiasts, as a Sr. CBAI with all of my above experience and more in mind, I strongly feel that coming to a BodyTalk for Animals seminar is a vital step on the journey to self awareness and is imperative in so many ways. The animals seem to provide a missing link on our journey, and are essential guides along the way. We seem to be at a critical turning point in our life on earth. 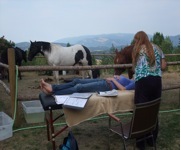 Communicating with the ancient wisdom of animals and our reconnection to nature is an integral aspect of the concepts taught in a BodyTalk for Animals seminar. Just as BodyTalk Fundamentals was your doorway into consciousness based medicine, BodyTalk for Animals is your doorway into the animal consciousness aspect of this modality, and as you take this free fall leap, your journey deepens substantially. I cannot express my gratitude enough to the thousands and thousands of animals and students along my path who have, and continue to teach me, and to John Veltheim for his compassion and love for the animal kingdom. Thank you John. In 2014 as the Sr. CBAI, I am excited to be the steward of the next phase of the ever-evolving concepts we work with via BodyTalk for Animals. "Like the warthog, we have just begun to unearth the potential of BodyTalk for Animals"! "Explore some of these concepts with me in a BodyTalk for Animals seminar". "You will find that there is "much more to it", than just using a surrogate to get a yes/no for an animal". In 2015 I will begin to host the majority of the BodyTalk for Animals, other BodyTalk classes at "Eagle's Eye Ranch", on Mt. Rose in the Okanagan Valley, BC Canada. After eight years travelling around the world sharing my passion for BodyTalk, I am so excited that I finally have an amazing home and location, where my partner, Andre (CBP), son Mason, daughter Emily, dogs - Link, Tiki, Burma, cat -Ichiban, horses - Pete, Lyra, Nova, cougars, coyotes, bears, deer, elk, moose, mice, hummingbirds, and more, will be hosting you. Come stay on site in the bunkhouse. Enjoy three home cooked meals daily. Bare your feet, walk the trails just out the back door and let the earth heal you. Enjoy the view. Sit by the campfire at night, debrief your day to the sounds of Andre playing the guitar, you may even fall sleep in the tipi!!! "Eagle's Eye Ranch" is here to share Nature with you!